This weekend Witness 2 soul steering plays at Scrapyard. 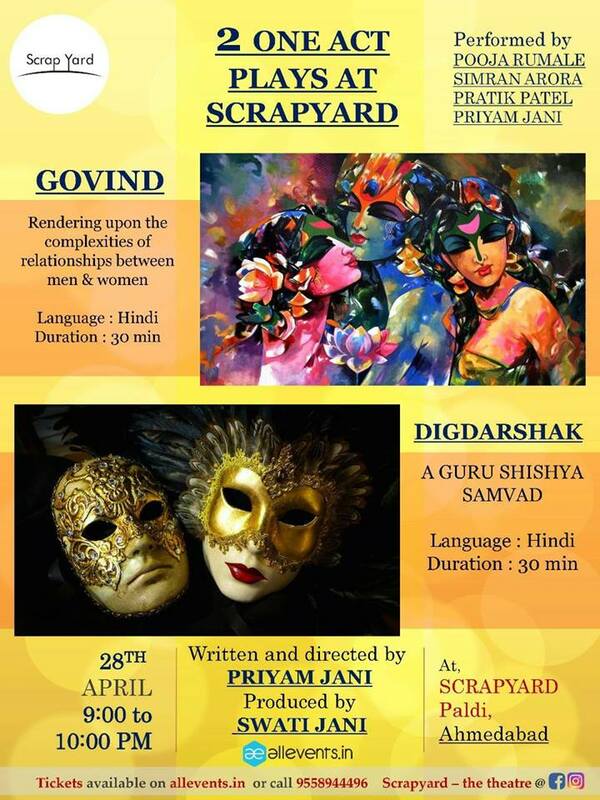 Written & Directed by Priyam Jani both these plays makes us ponder upon our approach & commitments towards our relationships. GOVIND – Govind, a documentary filmmaker, being married he falls in love with a prostitute.while one of his shoot in Mumbai. Govind’s wife visits Prostitute’s tiny brothel to convince her to forget Govind. Will prostitute agree to leave Govind? Or will it all add to the complexities, come discover with us this saturday. 9.00 PM. DIGDARSHAK – A story which deals with a Guru and his Shishya. Shishya, who is now a superstar, visits his old, fragile Guru after many years and realizes that Guru is upset with him. But why is Guru upset with his Shishya? Guru does not want to disclose the reason but Shishya is adamant and won’t leave without knowing the reason. This play won 2nd prize in prestigious BHAUSAAHEB HINDI EKANKI competition(which is held in Mumbai) and was given the award of BEST PLAY in E NATYA competition.